A country getting all its electricity from a combination of wind, solar and hydro sounds like science fiction. It’s not. This is part one of “Fight The Power,” a series about the people, organizations and countries transforming the way we think about energy for the better. Iceland isn’t blessed with much wind or sunlight. Not only does that make vitamin D a commodity, it also means solar and wind power is hard to come by. And yet 100 percent of Iceland’s electricity comes from renewables. Not 30 percent by 2025, like the US, or Australia’s 23.5 percent by 2020 target. It’s 100 percent renewable right now. Today. The heating and air conditioning of homes and office buildings: All fueled by geothermal energy. The electric sockets that power fridges, computers, TVs and more: Powered by hydroelectricity. And Iceland isn’t alone. Costa Rica. Albania. Ethiopia. Paraguay. Zambia. Norway. The electricity produced by all of these countries is either 100 percent green, or a few percent short. These advances will drastically curb greenhouse gas emissions, the same emissions that are threatening the Great Barrier Reef and California’s Redwood Forests, among other precious ecosystems. But a renewable future seems out of reach in countries like the US and the UK. My own country, Australia, is rich in renewable resources and has the money to invest, yet only around 15 percent of electricity is sourced from renewables. This is one of the many reasons Australia’s energy is now costlier, less reliable and more damaging to the environment than ever. There are many contributing factors to this. Among them is a troubling combination: The closure of coal stations and huge amounts of gas exportation have caused a deficiency in traditional power, but, as in the case of the US and the UK, the government hasn’t yet committed to renewable energy sources like solar, wind and hydro power. It all prompts the question: If Iceland can get all of its electricity through renewables, why can’t everyone? Historically, hydropower has been the cheapest way to source renewable electricity. But that’s changing. Wind and solar (also called photovoltaic solar, or PV) have become the most economic forms of electricity. They are the renewables of tomorrow. Solar energy for a long time was a nonentity, but exponential growth means a bright future. For the past four decades, solar energy has grown 37 percent each year on average, according to Matthew Stocks, a research fellow at Australia National University. That equals a doubling in solar production every three years, a trend that’s not expected to stop. This should mean great things for Australia, a country so rich in solar potential that some have dubbed it the Saudi Arabia of solar. “We have huge potential, far more than enough for our own needs, and we could be exporting solar energy in the future to Asia,” said Mark Diesendorf, associate professor of environmental science at the University of New South Wales. But that’s the future. Right now, solar panels around the country have a combined installed capacity of just over 7 gigawatts. Germany, despite being smaller and with less sun exposure than Australia, has an installed capacity of 41GW in solar energy. Solar can be implemented in two ways. Panels can be installed on the roofs of houses and buildings of all sorts, which absorb and convert sunlight to electricity that’s then stored in a battery. Then there are solar farms, where huge panels occupy a large swath of land, absorb the sunlight and funnel energy to the electricity grid. Germany has an elite solar game because a portion of its population, spurred on by government incentive, has added rooftop panels, Diesendorf said. Meanwhile, Australia’s hopes lie in solar farms. At the moment, wind is a greater contributor of electricity than solar. Farms are set up in a similar way. Huge turbines flow either with or against the wind. Wind spins the turbines, which are connected through a rotor and gear boxes to a power generator. As the turbines spin, power is generated. This is not science fiction, this is for real. Wind power is soaring in the US. Ironically, the state with the greatest wind capacity is oil-lovin’ Texas. Wind power can be sent straight to the electric grid, or stored in a battery. The trouble with the latter is that, at the moment, batteries big enough to store lots of energy are expensive. Thank God for eccentric billionaires. Elon Musk became a sensation in South Australia last year after he decided Teslawould build the world’s biggest lithium-ion battery there. He said he’d do it in 100 days or it’d be free. It was done in 60. Drawing energy from nearby wind turbines, the battery has an installed capacity of 100 megawatts, making it roughly three times larger than any other battery of its kind. But when you need electricity for more than just a few, it’s best to look out to the great blue. Solar and wind electricity are inexpensive and reliable, but they’re also variable. Everything is aces when the sun is shining on a breezy day, but a night with no wind means no new energy. And while excess solar and wind power can be stored in batteries, batteries big enough to hold more than a day’s worth of energy are still pricey. That’s where water comes in. Hydroelectricity is usually created through dams. Water from rivers gets funneled through tunnels, where it smashes through turbines housed in a power station. As the turbines turn, their rapid rotations create electricity. Australia gets around 7 percent of its total power from hydro. Pumped hydro, pictured below, is a little different. It’s the battery of the hydro world. Water is pumped from a lower reservoir to an elevated one, where huge quantities of it are stored. When electricity is needed, the floodgates of the elevated reservoir open, shooting through turbines and creating electricity. “Pumped hydro is a technology that’s been around considerably longer [than batteries] at a much greater scale and is actually a much cheaper way of storing energy,” said ANU’s Stocks. If we could build enough of these pumped hydro stations as backup for the variability of solar and wind power, Stocks said, Australia could easily get all of its electricity from renewables. And we don’t need as many of these stations as you may think. “We’ve been looking at something on the order of 10 to 30 of these systems spread around Australia in order to balance out the variability of the wind and the PV,” he said. There are over 22,000 eligible locations for such stations, according to ANU’s research. Historically, hydropower has been the go-to renewable way to create energy. But while the economics of wind and solar power are quickly outpacing hydro, pumped hydro stations offer a type of storage that’s difficult to achieve with those power sources. 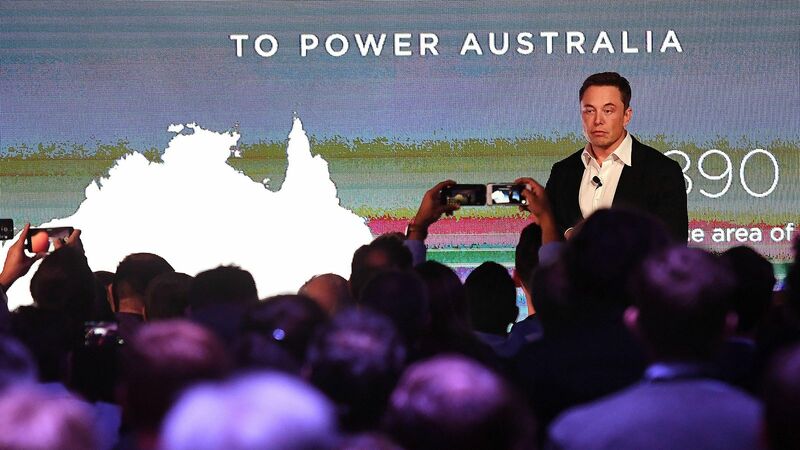 Musk’s Tesla battery was chosen for South Australia after a severe storm in September 2016 caused an almost-statewide blackout for multiple days. That blackout is exactly the situation pumped hydro can get a city out of. Energy has been at the forefront of Australian politics ever since South Australia’s blackout. But politics, experts say, won’t likely speed anything up. Politics are the reason Australia’s electricity isn’t more renewable right now. Diesendorf and his team at UNSW have been simulating Australia’s electricity market using only renewable energies. They’ve found that a renewable Australia is very much achievable. “We’ve simulated up to six years using real data on sun and wind and electricity demand, and in our peer-reviewed paper we’ve shown we could have operated the national electricity market if we’d installed enough [infrastructure] entirely on renewable energy with the same reliability as the same existing system,” he said. But transitioning into renewables isn’t a technical challenge, both Diesendorf and Stocks agree. It’s a political one. Energy has been a hot political topic in Australia over the past decade. A carbon tax, which penalized companies that were big carbon emitters, was enforced in 2011 by the federal Labor government and became one of the most controversial policies of the decade. Some believe it may have lost Labor the 2013 election. Many of Australia’s members of parliament aren’t sold on climate change, according to the Institute of Public Affairs think tank, which makes pushes for renewable energy tough. This isn’t just an Australian problem: Around half of the US Congress denies climate change, too. Part of the reason Germany’s solar push was so successful was that its government subsidized citizens who bought panels and batteries for their homes. But if a government is unwilling to commit to renewable energy, it’s not just citizens who shy away. “We’ve had a very extended period where division over clean energy has been a political process,” said Stocks. With the division comes uncertainty for businesses, he explained, who need to know their 20- or 30-year investment in wind, solar or hydro energy is a safe one. “If there’s uncertainty around politics, then things grind to a halt,” Stocks said. Today, Iceland gets around 25 percent of its electricity from geothermal energy, and a whopping 75 percent from hydropower. This didn’t happen overnight. The first hydrostation in Iceland was built in 1904, with a few more popping up in the following decades. These were relatively small projects set up by enterprising farmers and local technicians. There was great debate about how and when to use hydro power. It wasn’t until 1947, over 40 years later, that the government started getting serious about hydropower. It built a station with an installed capacity of 10MW. The National Power Company (Landsvirkjun) was set up in 1965, and that’s when hydro started to become an electrical bedrock for the nation. The average US household uses 911 kilowatt-hours a month, according to Inside Energy. Today, Iceland’s biggest hydroelectricity producer is the Kárahnjúkar Hydropower Plant — it creates around 4,600 gigawatt-hours of energy a year. In total, Iceland’s hydropower stations generate roughly 13.65 terawatt-hours a year, says the International Hydropower Association. Yet Iceland is still very much just the tip of the hydro iceberg. It’s just one of many countries that reap huge rewards from hydro power, according to Martin Young, director of policies and risk for the World Energy Council. Australia currently has more modest aims. The federal government hopes to have 23.5 percent of energy come from renewable sources by 2020. In the US, a country that Stanford University says has more than enough resources to run entirely on renewables, the goal is 30 percent by 2025. “On the technological and economic side, the prospects are excellent,” Diesendorf says of renewable energy.